Updated The rogue root certificate in new Dell computers – a certificate that allows people to be spied on when banking and shopping online – will magically reinstall itself even when deleted. El Reg can confirm that the eDellRoot root CA cert, discovered over the weekend, automatically reappears when removed from the Windows operating system. We tried this on a Windows 8 Inspiron 15 series laptop that was bought in July this year for our San Francisco office. You can find the dangerous certificate by opening up the Start menu, select "Run", type in "certmgr.msc" into the box and hit Enter. 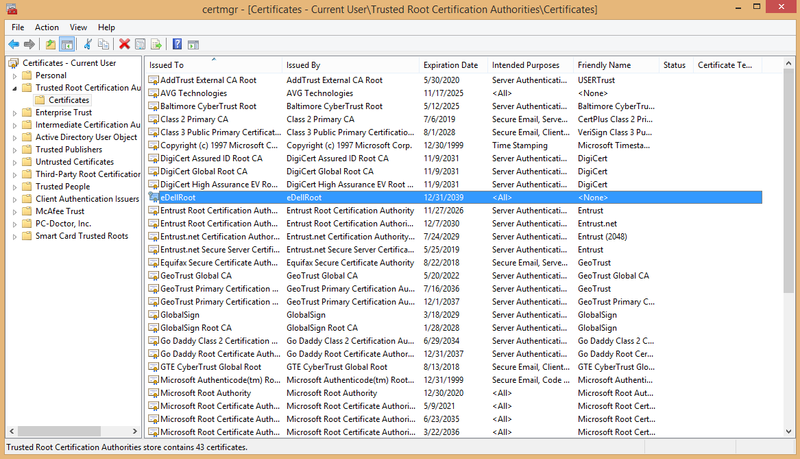 Then open up the "Trusted Root Certification Authority" folder on the left, then "Certificates", and in the window should appear "eDellRoot". That's the SOB you're looking for. Right-click over it, hit "Remove", click through the warning box. And it's gone. Then reboot, reopen certmgr.msc – the Windows certificate manager – and search for the certificate "eDellRoot". Bingo, it's back. Visiting one of the websites that test whether you have a vulnerable certificate installed reveals that, yes, the removed root CA cert was put back during or after the reboot. Lenovo had a similar party trick with its bloatware earlier this year, using Microsoft's Windows Platform Binary Table. How Dell reinstates the missing certificate is not clear at this stage. This means that the recommended procedure to get rid of the vulnerable root CA file on Windows will not work, as the component reappears upon restart. The certificate, issued by Dell in April and expires in 2039, contains a private key that can be extracted and used to pull off man-in-the-middle attacks on Dell owners – like Lenovo's Superfish cluster-fsck. For example, usernames, passwords, session cookies and other sensitive information can be silently siphoned from affected Dell machines when they connect to the web through malicious Wi-Fi hotspots in cafes, hospitals, airports, and so on. People with recent XPS, Precision and Inspiron models should use Mozilla's Firefox to browse the web as this software has its own set of trusted certification authorities, and ignores the dangerous eDellRoot cert. Remember: Local Root CAs OVERRIDE certificate pinning. Defenses against SSL hijacks by using HSTS do not engage. Dell's support line tells people the certificate "doesn't cause any threat to the system." On Twitter, the IT giant said: "Customer security and privacy is a top concern for Dell. We are investigating the issue and will have further updates soon." According to an analysis [PDF] by Duo Security, a bundled plugin reinstalls the root CA file if it is removed. First, you must delete Dell.Foundation.Agent.Plugins.eDell.dll from your system (search for it) and then remove the eDellRoot root CA certificate. The cert, we're told, is used with the plugin for receiving cryptographically signed telemetry requests; said telemetry includes things like the machine's service tag, a seven-character serial number that identifies the computer model, if not the individual machine. "This highlights a disturbing trend among original equipment manufacturer (OEM) hardware vendors. Tampering with certificate stores exposes users to unnecessary, increased risk," the Duo team – Darren Kemp, Mikhail Davidov, and Kyle Lady – wrote in their report. "Tampering with the certificate store is a questionable practice, and OEM’s need to be careful when adding new trusted certificates, especially root certificates. Sadly, OEM manufacturers seem to not be learning from historical mistakes and keep making them over and over."